I lecture on the benefits of progressive resistance exercise. 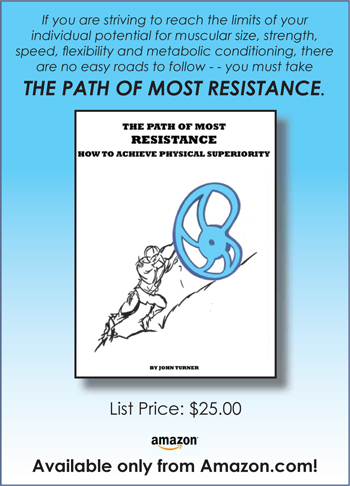 My PowerPoint presentation, The Path of Most Resistance, explains the requirements of full-range exercise, debunks superstitions and myths, incorporates critical thinking, anatomy and physics, promotes safety and concludes with a unique anti-steroid message. I have given my presentation to college students, academics, Athletic Directors, law enforcement, athletes, coaches and trainers. If you are interested in achieving physical superiority, there is no easy road to follow. To learn the principles behind greater strength, speed, flexibility and metabolic conditioning, please contact me for more information. John Turner has just six words for those trying to improve their current physical condition - - take The Path of Most Resistance. Turner has received thousands of emails from all over the world from people who desperately want to try the original Nautilus machines and apply the Nautilus Training Principles to their exercise programs. If you are serious about reaching the limits of your individual potential for muscular size, strength, flexibility and metabolic condition, there is no easy road to take. You could read hundreds of exercise books and thousands of bodybuilding magazines and not find the information contained in The Path of Most Resistance.